What is Omphalosaurus? A sister to Largocephalosaurus. Updated October 28, 2016 with a nesting of Omphalosaurus as a sister to Largocephalosaurus, an aquatic diapsid, basal to enaliosauria. Omphalosaurus nevadanus is a formerly enigmatic marine reptile. Known from only a few scraps (ribs, vertebrae) plus a few skull pieces that few paleontologists can confidently identify (and some very strange ones they can! ), Omphalosaurus has baffled workers for over a hundred years. Considered “aberrant and fragmentary” by Maisch (2010), Omphalosaurus has been nested in and out of the Ichthyopterygia because there are no closely related sister taxa. It really was ‘out there,’ pretty much all alone. Here in the large reptile tree (subset Fig. 4) Omphalosaurus nests with Largocephalosaurus outside the base of the Enaliosauria. Figure 1. Omphalosaurus palate with elements colorized. Note the huge expanded splenials from Motani 2000. The palate is broad like that in Claudiosaurus, but toothless. Meriam (1906, 1908, 1911) erected the genus based on a fragmentary skull with two associated vertebrae from the middle Triassic of Nevada. He considered it a distinct sort of reptile possibly related to placodonts or rhynchosaurs based on the button-like and disordered dentition. Shortly thereafter, Wiman (1910) described similar teeth form the Lower Triassic of Spitzbergen. The postcranial bones included discoidal vertebrae and humeri that resembled those of the ichthyosaur, Shastasaurus. Wiman (1910) erected a new genus and three species based on fragmentary remains. Later papers by both workers split the fossil generically, considering the vertebrae ichthyopterygian, and the dentition something else. More recent papers lumped Omphalosaurus with the ichthyosaur, Grippia, typically without citing reasons for doing so. Mazin (1983) stated reasons for including Omphalosaurus within the Ichthyopterygia. Tichy (1995) described a more complete specimen from Austria. Sander and Faber (1998) added data to this enigma. The holotype (UCMP 8121, University of California Museum of Paleontology, Berkeley) is difficult to interpret, according to Motani (2000). The key feature of Omphalosaurus is the presence of rounded teeth that do not form a single tooth row, but are established, almost randomly, along the premaxilla and dentary. The maxilla (Fig. 2) appears edentulous. The extent of the splenials is also unmatched, including an elongated symphysis. Motani (2004) concluded that the Wiman (1911) Spitzbergen material consisted of several distinct genera. Motani (2004) nested Omphalosaurus outside of the Ichthyopterygia, more basal than Utatsusaurus. This is always a problem nesting enigmas at the base of any clade without including further outgroups. Figure 2. Omphalosaurus nevadanus, MBG 1500, the Austria specimen, skull portion in situ, mandible parts, skull parts and reconstruction with matching colors based on Sinosaurosphargis, the only other taxon with such a large set of splenials. The premaxillae are wider than the dentaries. Distinct from Sinosaurosphargis, the premaxillae were much enlarged. 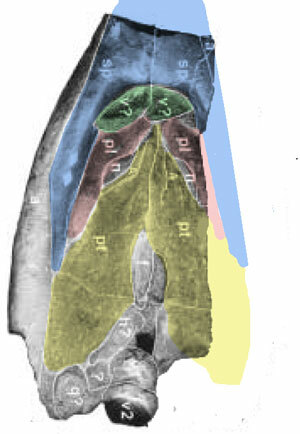 Sander and Faber (2003) extended the splenials to the tips of the jaws, but this evidence suggests they did not extend as far forward as the dentaries. when looking for the closest known sister taxon. Fortunately this trait is extremely rare, virtually unknown elsewhere within the Reptilia. Look for any other marine taxa that has a greatly extended/expanded splenial and you are left with just two taxa that were not previously considered in any discussions of Omphalosaurus. Figure 3 Largocephalosaurus nests between long-necked tiny Claudiosaurus and short-necked turtle-like Sinosaurosphargis. These represent an entirely new clade of marine reptiles. Sinosaurosphargis is clearly greatly derived with a turtle-like shell and and Largocephalosaurus is not so derived, these are the only other taxa with an extensive set of splenials that form a symphysis anteriorly, brief though it may be. The teeth are not so derived. The ribs were not so derived. Even so, the splenials were similar. So were other skull bones, like the much greater width of the premaxillae compared to the dentaries. And when you’re dealing with an enigma like Omphalosaurus, so different from any other fossil currently known, you grasp at straws. Others have not attempted to match these taxa to Omphalosaurus. A phylogenetic analysis of Omphalosaurus (Fig. 4), agrees with Motani (2004) who nested it outside the Ichthyopterygia. Way outside. It is indeed a sister to Sinosaurosphargis and Largocephalosaurus, as it appears based on the extent of the splenials, then Omphalosaurus nested just outside the Enaliosauria derived from a sister to Hovasaurus and Claudiosaurus. That means it probably had a similar elongated post-cranial morphology. There are no indications of the unusually elongated transverse processes and carapace that characterize Largocephalosaurus and Sinosaurosphargis. Even so, Omphalosaurus and its close sisters form a completely distinct clade apart from the Enaliosauria. Merriam JC 1906. 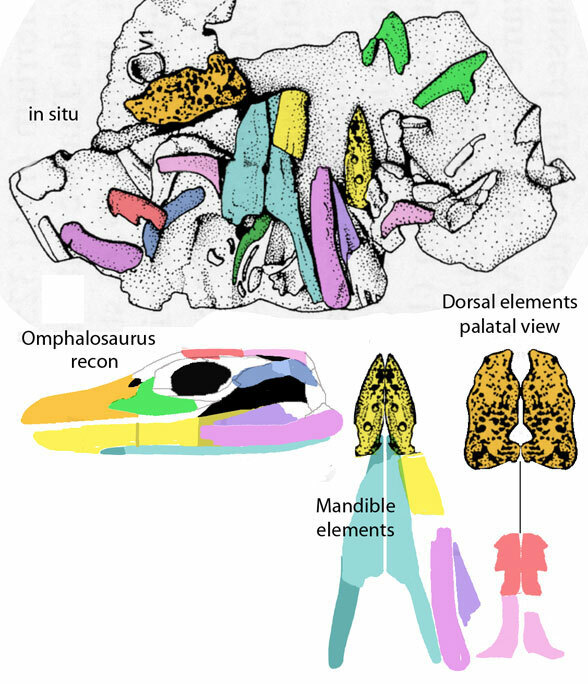 Preliminary note on a new marine reptile from the Middle Triassic of Nevada. University of California Publications, Bulletin of the Department of Geology 5:71–79. Merriam JC 1908. Triassic Ichthyosauria, with special reference to the American forms. Memoirs of the University of California 1:1–196. Merriam JC 1911. Notes on the relationships of the marine saurian fauna described from the Triassic of Spitzbergen by Wiman. University of California Publications, Bulletin of the Department of Geology 6:317–327. Motani R 2000. Is Omphalosaurus ichthyopterygian? — A phylogenetic perspective. Journal of Vertebrate Paleontology 20(2): 295-301. Sander PM and Faber C 1998. New fi nds of Omphalosaurus and a review of Triassic ichthyosaur paleobiogeography. – Paläontologische Zeitschrift, 72: 149–162. Sander PM and Faber C 2003. The Triassic marine reptile Omphalosaurus: Osteology, jaw anatomy, and evidence for ichthyosaurian affi nities. – Journal of Vertebrate Paleontology, 23: 799–816. Wiman C. 1910. Ichthyosaurier aus der Trias Spitzbergens. – Bulletin of the Geological Institution of the University of Upsala, 10: 125–148. This entry was posted in ichthyosaurs, Placodontia, sinosaurosphargis and tagged evolution of ichthyosaurs by davidpeters1954. Bookmark the permalink. Regarding the taxonomic composition of the Early Triassic reptile assemblage from Spitzbergen, the omphalosaurid remains from Spitzbergen were originally described as part of the syntype series of the shastasaur-like ichthyosaur Pessopteryx nisseri by Wiman (1910). Merriam (1911) and Wiman (1916) recognized that the jaw fragments belonged to Omphalosaurus, but that the humeri belonged to a ichthyosaur. The omphalosaurid material described by Wiman was finally described as a new species of Omphalosaurus, O. merriami, by Maisch (2010) (who also designated one of the syntype humeri of P. nisseri as the lectotype of P. nisseri). Thus, Pessopteryx is known only from four humeri (lectotype, two paralectotype humeri, and holotype of Merriamosaurus hulkei), while Omphalosaurus merriami is known only from the jaw fragments. Wiman, C (1916): Notes on the marine reptile fauna of Spitzbergen. – Univ. Calif. Publ. Bull. Dept. Geol., 10: 63–73; Berkeley. Had you test Xinminosaurus?A undoubted primitive ichthyosaurian.Maisch claimed it as the most the most powerful evidence. It is really a interesting ichthyosaur,has primitive fins and obvious tailbend. Thanks. First I’ve heard of Xinminosaurus.